In 1998 I walked around the less busy side of the Ngorongoro Crater with a small bunch of friends and a band of Maasai warriors whilst donkeys carried a fairly simple mobile rig. Entamanu and the wishing tree. The donkeys proved unreliable but to climb up the path from the Olmoti Crater through the Layani forests to the Empakai Crater which sits in the shadow of the sacred Maasai mountain, Ol Donyo Lengai, was a wonderful adventure. Nomad, my favourite Tanzania safari company, outfitted this exploratory safari: the next time they organised it, the donkeys had transmogrified into a big Unimog! Nearly twenty years later Nomad are opening a semi-permanent camp on this unfrequented rim of the crater, and I am wholeheartedly behind them in their bid to look after our clients on the road less travelled. This environmentally friendly camp has a double aspect: on one side a plunging view into the largest unbroken caldera in the world; and on the other a breath-taking vista of the endless plains of the iconic Serengeti. There are no indigenous religious buildings here as one might find in India, but a big fig tree by the camp has been of spiritual significance for the Ilkisongo clan of the Maasai for generations. Older women of the tribe used to pray there, perhaps for an ailment to be cured or to hasten the end of a drought. Even today, passing herdsmen will leave a small handful of grass at the base of the tree, sitting quietly for a moment as a sign of respect. Up here, besides enjoying the obvious game-viewing in the crater, you can walk away from others and experience real cultural interaction with the local Maasai. And we can get you there, albeit with a few bumps, by a trustier steed than a donkey in the form of a Land Cruiser with a drinkies fridge on board. But if you still want the real deal of a walking adventure then see below. Walking with the Hadza tribe in the Yaeda Valley. A couple of hours’ bumping down from the highlands takes you to the Gideru hills, a hidden swathe of African bush carpeted with picturesque acacia and baobab woodlands, dotted with dramatic rocky hills and seemingly cut off from civilisation. It now forms the core of what is left of this unique people’s traditional rangelands. A few years ago a presidential decree granted the Hadza a title deed to this special corner of the wild. 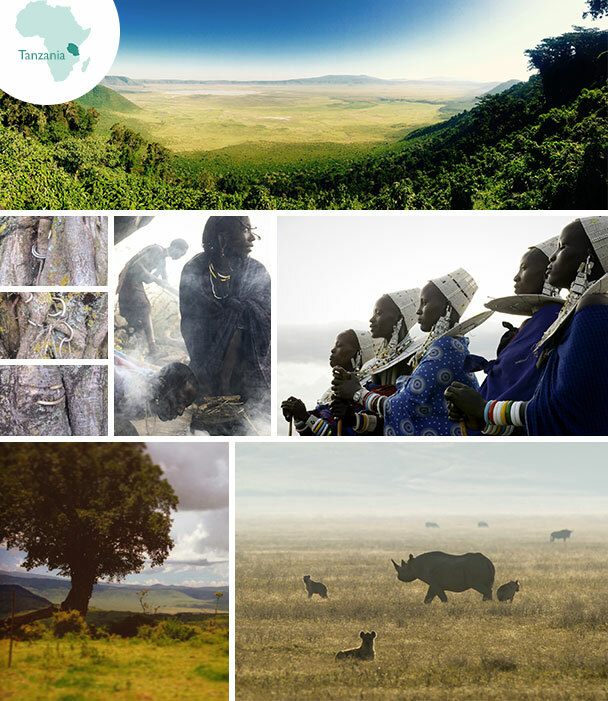 While the woodlands provide the Hadza with food and other resources that allow them to practise their ancient lifestyle, they also bring financial benefits through an ambitious and innovative conservation project run by Carbon Tanzania. 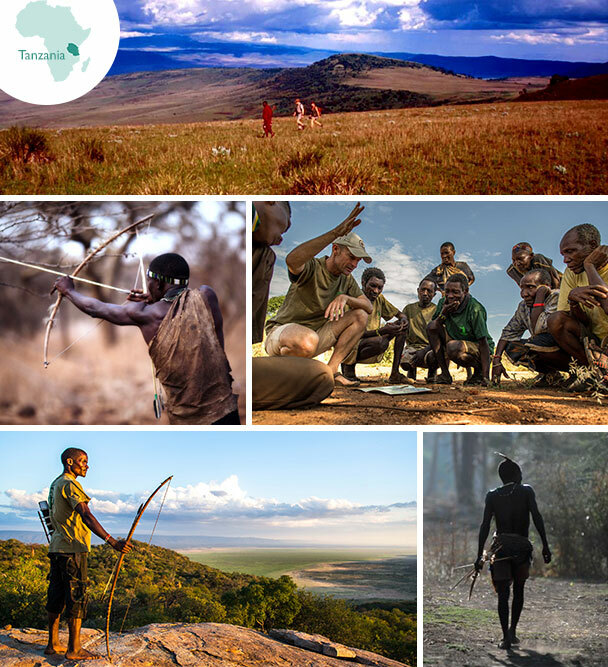 Jo Anderson, the co-founder of this enterprise, is the charismatic leader of walking adventures in this area, providing an interface between the simple yet inspiring lifestyle of the Hadza and the conservation desires of the wider world. The carbon emissions generated by your safari holiday can be offset by your donating a relatively modest sum to this project which for the past five years has been helping the Hadza to protect their land rights, educate their children and access health-care services. A few days’ walking here links perfectly with a Serengeti eco-system safari. 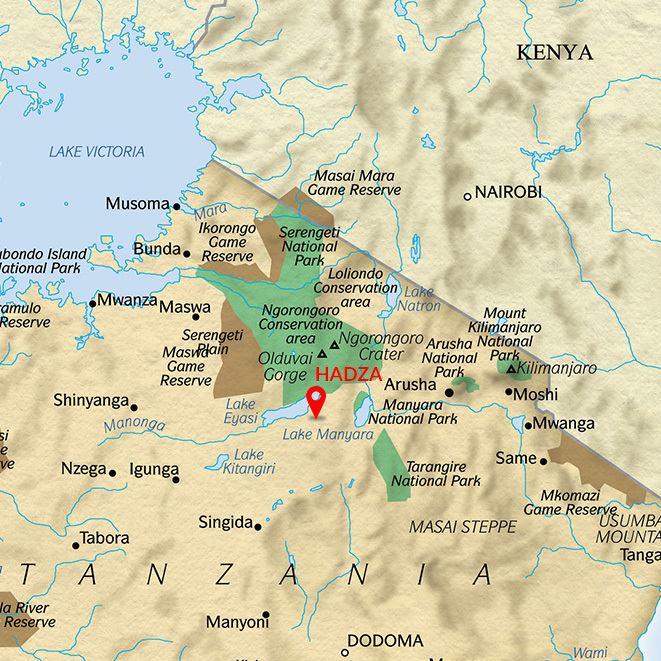 Click this link for a Serengeti ecosystem map.